Microsoft announces Xbox One S Minecraft Creators Bundle. Microsoft today announces Xbox One S Minecraft Creators Bundle. The Xbox One S Minecraft Creators Bundle includes Xbox One S with 1TB hard drive, 4K Ultra HD Blu-ray player, Xbox Wireless Controller and more. + Starter Pack DLC: Greek Mythology Mash-up, Plastic Texture Pack, Skin Pack 1, and Villains Skin Pack. Xbox One S delivers brilliant graphics with HDR technology, premium audio and the best community of gamers. Games play best on Xbox One and as part of the Xbox One family, you can enjoy more than 1,300 games, including exclusives like Forza Horizon 4 and Sea of Thieves. 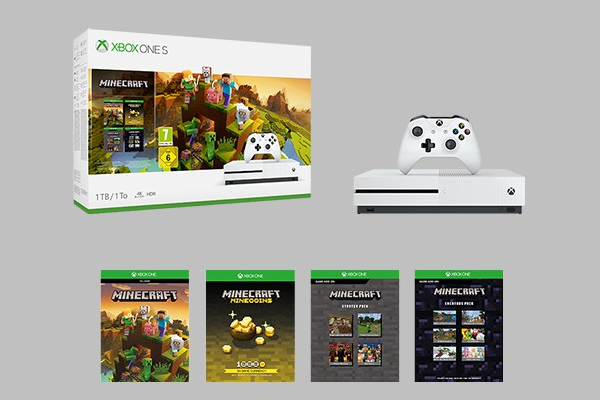 The Xbox One S Minecraft Creators Bundle available soon at select retailers globally for $299 USD / £249 GBP.